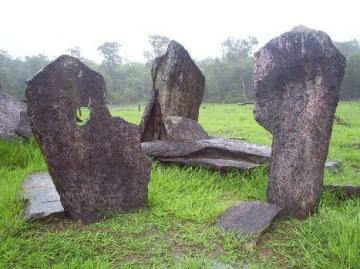 The Parque Arqueológico do Solstício (Solstice Archaeological Park) is an archaeological park located in Amapá state, Brazil, near the city of Calçoene. The site contains a megalithic stone circle, colloquially known as the Amazon Stonehenge. The Parque Arqueológico do Solstício (Solstice Archaeological Park), referred to in academic sources as AP-CA-18, is an archaeological park located in Amapá state, Brazil, near the city of Calçoene. The site contains a megalithic stone circle, colloquially known as the Amazon Stonehenge. The megalithic site consists of 127 blocks of granite, each up to 4 m (13 ft) tall, standing upright in a circle measuring over 30 m (98 ft) in diameter. It is located on a hilltop on the bank of the Rego Grande river. Archaeologists believe that this site was built by indigenous peoples for astronomical, ceremonial, or burial purposes, and likely a combination. The function of this archaeoastronomical site is unknown, much like other sites such as Stonehenge, a much older site in Great Britain.